These large terminal kits are ideal for large or multiple projects. 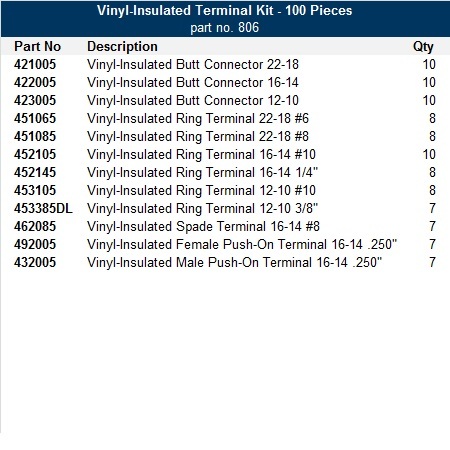 The kit contains a large assortment of different gauged vinyl-insulated terminals. One kit provides just the terminals, and the other has an included crimping tool. 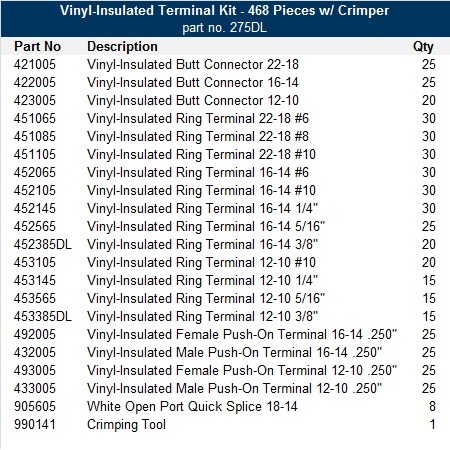 An assortment of 468 vinyl-insulated terminals plus a crimping tool. Contained within a heavy-duty, baked-on gray hammerstone steel box (18" x 12" x 3"). 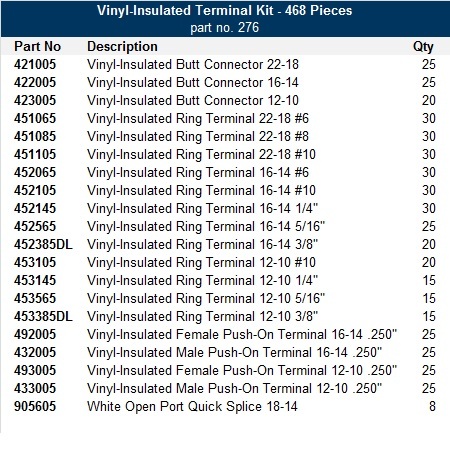 An assortment of 468 vinyl-insulated terminals. These terminal kits have a great assortment of our most popular vinyl-insulated crimp terminals. Two variations of this kit are available for your convenience. One kit provides just the terminals, and the other has an included crimping tool. 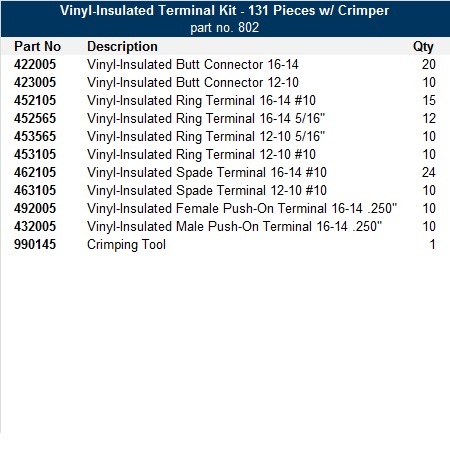 An assortment of our most popular vinyl-insulated crimp terminals plus crimping tool. All contained within a durable, lightweight, translucent carrying case (11" x 6-3/4" x 1-3/4"). This kit contains a balanced stock of our most popular vinyl-insulated crimp-on terminals. A crimp tool is not included with this kit. Contained within a durable, lightweight, translucent carrying case (11" x6-3/4" x 1-3/4"). Contained within a durable, lightweight, translucent carrying case (5-1/8" x 4-7/8" x 1-1/4").